Urban Riding: is the Cycle Slowing? Popular wisdom says that urban bicycle riding is on the up. But the truth seems to be otherwise. In many places active urban cycling could be declining in popularity. By James Teo and The Dirt. The Volvo Ocean Race sees some of the most technically advanced sailboats compete over 83,000 kilometres around the world, using just wind for power. At sea, competitors see a lot of deep-sea pollution - so they are doing their bit to increase sustainability. News from the aviation world has not been encouraging of late. Increased overall emissions, worries about safety and peripheral noise – but some airlines are making sustainable, safe operation part of their marketing pitches. Melting ice-caps means rising sea levels and city flooding. But it will open more land for cultivation – for humans. Sadly for polar bears, loss of sea ice means starvation. Singapore has long been a taxi and public transport-friendly state, but it has lagged some other places when it comes to electric vehicles. But now, its taxi fleet is making up for a slow start. Ravaged Reefs : Are Sunscreens Killing our Coral? We all know about the harmful effects UV rays on delicate kiddies’ skins. Sunscreens are being applied by the tube-load every day – but the bad news is, excess washed-off sunscreen could be killing corals. There is a dark side to internet shopping. And it’s us that is making it worse. There is plenty of evidence that outdoor activity is a tonic for the senses. But keen proponents of arboreal and aquatic pursuits claim they are good for the body, too. One of the most common and rising sources on the planet is hardly mentioned by most campaigners. It is not oil, or coal, or shipping – or even farty cows. Cementand concrete are used in every country in the world, and are massive contributors to CO2 emissions. Electric Scooters: Boon or Bane? Europe, January 20, 2019. Electric hire scooters have become a familiar sight in many cities across the US and Europe, as well as a few in Australia. Dotting street corners in tidy rows in the mornings, dumped haphazardly outside office buildings after the lunch hour, and zipping down streets and pavements all hours of the day, electric scooters are fast becoming a ubiquitous feature of many urban landscapes. The potential benefits of electric scooters as part of a city’s transit infrastructure are substantial. 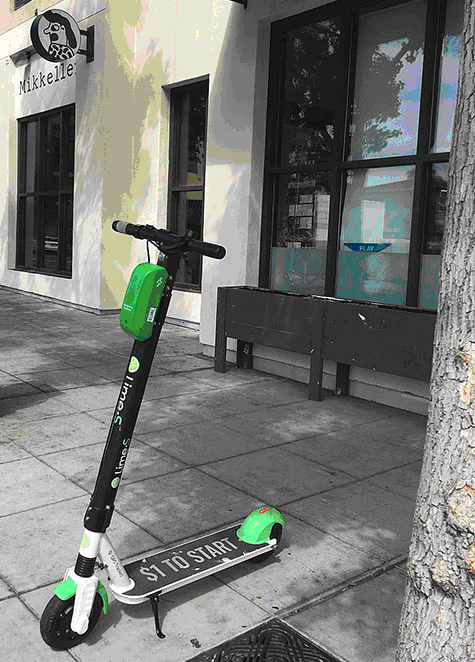 Leading electric scooter companies, such as Bird and Lime, Scoot, Skip and Spin tout their products as an alternative non-vehicular means of transportation, a zero-emission people-moving mechanism that can reduce short distance single-occupant car trips. All this is true. Commuters who use public transportation for the bulk of their commute and who cannot or do not wish to use a bike (or walk) for the final distance to work can cut emissions and cost as well as congestion by hopping on an electric scooter. Consequently, both workers and tourists like them – and they have the benefit of being fun to ride. Scooter riders must first download the provider company’s app using onto a smartphone. First-time users need to enter a credit card for payment (entered one time then used for all subsequent purchases, similar to the way the Uber and Grab apps work), plus a photo of a driver’s license to verify age and creditworthiness. A rider simply launches the app, scans the unique QR code and off they ride. Courtesy Bird. Typically, scooters are placed out on pavements in neat rows in groups first thing in the morning, after being charged overnight by voluntary “Juicers” who charge the batteries in their homes overnight, for a small payment. The theory is that the Juicers will also rescue any dumped scooters (in the Yarra River, up a tree in Sydney, clogging a bus shelter in Singapore etc). This supposedly helps avoiding the clogged and damaged discarded-bike heaps that Singapore-based oBike experienced and which drove the company into bankruptcy. Once loaded on a rider’s phone, the app uses GPS tracking to show locations of unoccupied nearby scooters that are ready to be checked out. Users then simply scan the scooter ID code their app, power up and ride off. Rides are priced by the minute, timed from check-in to check-out using the app. Once the riders arrive at a destination, there is no need for them to return the scooter to a rack, as with Boris Bikes in London. Local Juicers will track it down, rescue it and put it back in the right place once they have charged it. But the rapid expansion of instant hire electric scooters has drawn both support and criticism. Cities including Barcelona, Valencia and (although retracted) San Francisco all banned their use. By understanding the pros and cons of electric scooters and various regulatory considerations, landscape architects and urban planners can help cities make the most of this significant private investment in the public realm. There certainly are issues. Critics have observed the need for a credit card limits use across the entire socioeconomic spectrum; those with no card still have to walk. However, some cities like Washington D.C. are hoping to develop a method for cash payment. Some apps also require riders take a photo of the scooter where it is stopped at the end of the ride, in order to record potentially illegal parking practices used by some riders. Is this an invasion of privacy? Some might think so. Operators advise rider to behave sensibly - but cannot enforce any rules. Courtesy Bird. Then there is safety. Scooter companies are beginning to put money and effort toward improving the safety of scooter riders - and other road/way users. Bird recently announced plans to form a Global Safety Advisory Board, with the goal of improving electric scooter safety. The company has also proposed a funding strategy whereby $1 daily per vehicle in a city’s fleet will be dedicated to a fund for improving bicycle lanes and infrastructure. Some companies are also offering user data to city planners; valuable data metrics in understanding the flow of people through the city, site pre-development predictions, or post-occupancy analysis. There are upsides to scooter usage. Europe, including Athens, has taken up electric scooters with gusto. Courtesy Wikipedia. To address safety concerns, scooter companies generally require scooter riders wear helmets and meet a minimum age requirement. But these requirements are frequently violated by users, as are regulations requiring scooters be or not be ridden on the pavement, roadway, or in a bike lane or whatever local regulations dictate. Conflicts between pedestrians, bicyclists, vehicles, and scooters are difficult to avoid without formally set and well-understood rules for where and how a scooter should operate. Also, many scooter companies (inspired perhaps by Uber’s business model) have chosen to launch a fleet in a new city without asking first. When Wind launched its permission-free scooters in Madrid last year, the police removed and impounded them almost immediately. Likewise Valencia, and Santa Monica. This “begging for forgiveness rather than asking for permission first” approach when launching scooter fleets has seen frequent instances of implementation without consulting city officials. This is what prompted San Francisco to temporarily ban all electric scooters, although it eventually offered two permits to companies Skip and Scoot. And New York City the authorities, taking into consideration the existing population density of its pavements and bicycle lanes even without scooters, issued a firm “thanks, but no thanks” to potential scooter companies. There is no doubt electric scooters can replace much vehicular use, particularly single-occupant, short-distance car trips in congested urban environments. At the same time, city management and planning authorities must carefully weigh the risks to public safety before approving electric scooter programs for operation. Overall, the usefulness of scooters in urban settings and the potential to replace short car trips has driven enormous investment into electric scooter companies by investors who see the benefits. Ford recently purchased Spin for nearly $100 million, while Uber has partnered with Lime. And they obviously fill a pressing need; Bird has reported more than 10 million rides to date. Stockpiling e-scooters then claiming for charging them up means less available for use. This has become a problem in some cities. Courtesy YouTube. There are practical hiccups – scooter hacking, torching, and stockpiling (with the intention of making serious money as a Juicer) have all impacted the business models of operating companies. Nonetheless, the average scooter in a major US city earns over $15 a day, meaning each scooter will pay for itself in a month or so. But if a reasonable percentage of those scooters either vanish or are not available, the business model will not look so rosy. The big question is what a scooter costs to service, maintain or replace if stolen or wrecked. Theft and vandalism severely damaged the bicycle hire market in Australia and Singapore, and led to bike hire companies being bankrupted. With clear rules and robust public awareness campaigns to ensure all users understand the rules for legal operation, scooters may come to safely co-exist with existing users of the public right of way. E-scooters are relatively safe, unobtrusive, clean and cheap. It looks like they are here to stay, but also means cities have the opportunity and challenge to establishing a safe framework in which citizens and visitors can enjoy the full benefits of the new, disruptive transport technology. Doughnut Economics: Time to Dump GDP as a Benchmark? Kate Raworth, an English economist, has reservations about using GDP as a continuing growth model. Her new theory, titled Doughnut Economics, highlights a need for balance between quality of life and environment for a thriving and inclusive economy. Glasses makers Dresden Optics have set up business in a completely new sector, with a product that competes with established players, and that boasts sustainability as a key selling point. Every Chilean man woman and child discards 1.5 plastic bags each day, many into rivers or directly into the sea. With its beaches and ocean becoming increasingly defiled by rubbish, the Chilean government has called enough and banned giveaway plastic bags. Completely. The transport sector contributes 28% of Greenhouse gas emissions in the US. One developer is nudging tenant behaviour by providing an immediate economic benefit to residents of a new development who cut car usage and use public transport or carpooling instead. A US-based plastics company has teamed up with a Bangkok surfboard company to produce surf and paddle boards made from discarded fishing nets – and are giving oceanfront villagers a new source of income along the way. The pando, the world’s largest, and possibly oldest living thing is wasting away. And guess what? – it’s mainly the fault of humans and their need to interfere. Cuba has a reputation for primitive agricultural practices. But being isolated from the latest farming methods and chemicals for the last 60-odd years has an upside. Its bees are as green and pure as they come. Explaining the beauty and importance of wild and conservationally-important places can be difficult given their remoteness and lack of access. A Tasmanian campaign group, the Bob Brown Foundation, has turned to technology to help spread the word. The ‘Overtourism’ report by UNWTO aims to help stakeholders manage growing urban tourism flows and their impacts for the benefit of visitors and the cities’ hosts – the residents. Mallika Naguran reports.